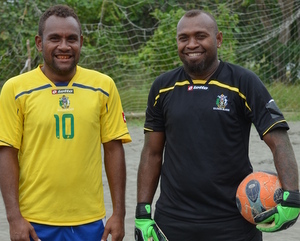 The duo have played 68 top grade matches between them including every single match that Solomon Islands has played in the discipline since it entered competitive beach soccer in 2006. Naka has scored 52 goals in his career for an average of 1.5 goals per match but Hale’s position as a goalkeeper makes him an invaluable asset to the team. Both players agree that after four world cups they are not looking at finishing in the group stage anymore – the Bilikiki are now eyeing moving into the quarter finals and beyond. “It is our aim even before the qualifiers to take this team to the second round but first we had to get past the regionals. Now that we have qualified we are focussed solely on winning at least two matches to secure a place in the quarter finals,” says Naka. However, this will be big ask for the team whose barely had time to prepare for the world cup having only qualified a week ago. The Bilikiki are in Group B along with heavy weights Argentina who are ranked among the top five teams in the world and El Salvador who finished fourth in 2011 even though it was only their third world cup. The Bilikiki’s real hope is to stun debutants the Netherlands to give their plan some traction before they meet the other two. If this is the plan then the 2013 FIFA Beach Soccer World Cup schedules also agree since they meet the Oranje in their opening match on the 19th of September. However, beating Europe’s fourth team will not be easy and it will come down to the wire when they meet and this is where the experience Naka as the top scorer and Hale as the leader will come into play. According to Hale the challenge at the world cup is more tactical than physical and this is the area where the Bilikiki will need to step up their game. “From my experience, the world cup tends to be more tactical and is played more in the head and this is contrary to the OFC qualifiers where it is very physical and fast paced. We need to keep our cool, conserve our energy and target our opponent’s weak spots rather than rush and throw everything we have in one go,” Hale says. Hale, dubbed ‘papa’ or father, by his team mates is the undisputed leader on and off the pitch for the Bilikiki. His experience as an organiser and the voice of inspiration for the players has been called in time and time again for the Bilikiki over the years and it could be the difference between Solomon Islands making the second round or not this year. Naka’s sneaky left foot has been his greatest asset to the Bilikiki over the last seven years. His ability to rapidly turn and shoot powerfully and accurately have has lifted Solomon Islands to many of their wins including four in the 2008 FIFA Beach Soccer World Cup over El Salvador. His services will be essential in whatever game plan head coach Gideon Omokirio throws to the team. The Bilikiki will leave Solomon Islands on Tuesday to train in Tahiti before the world cup kicks off on 18th September. Bilikiki is sponsored by Our Telekom.